If anyone’s been following my blog for a few years, you may remember back in 2013-2014 when I first took on Project 365. I’ve decided to do it again this year and started in the middle of June. For those who don’t know, the premise is simple: take one photo each day for a year. I’ve chosen to once again catalog my attempts at this project through Instagram, since I like it as a public forum and I think it’s a good way to keep myself on track. Some days are easier than others. Some days, simply put, are crazy busy, not necessarily with anything interesting, and I nearly forget to take a photo. Other days are busy in a different way and leave me with photo after photo to choose from. Either way, it’s another endeavor I’ve chosen to pick up – and I think it’ll be especially great with my big trip to New England coming up in under two weeks! If you’re interested, check out my Instagram for this project here. Doing a Q&A: The Photographic Interview has been on my bucket list for…. well, as long as I can remember. This one came via http://sh1ft.org/ years and years and years ago (2007, maybe?) and now, some nine years later, I’ve finally gone and done it. This is a task that’s been on my “to-do list” for a long time — a very, very long time. I found this site years ago – http://sh1ft.org/ – which hosts photographic projects; I found a “26 things” one, wherein you’re given 26 words and are instructed to take a photo to represent each word. Many years later, I’m finally tackling one of the projects. This one is a little different, as it has 13 items and asks that you take two photos for each word in a set list. Obviously, it’s up to you, the photographer, to interpret each word and determine what kind of photo you want to take for that word. The two photos might be similar, or they may be at completely opposite ends of the spectrum (as with some of mine.) That being said, here’s mine! 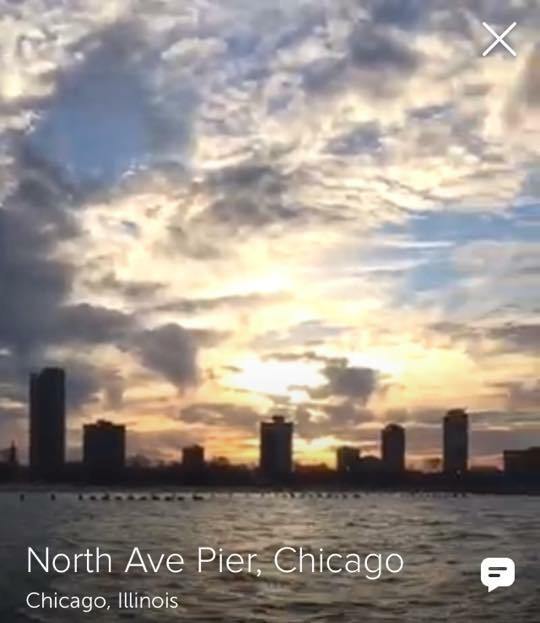 One minute, I’m sitting on the pier in Chicago, watching the sun set over Lake Michigan. Two minutes later, I’m walking to the bus stop in Hong Kong. Then I’m sailing on the Hudson River, passing the Statue of Liberty and looking back at that gorgeous Manhattan skyline. Next thing I know, I’m in Italy, strolling through the streets and listening to live music. All the while, I’m sitting on my couch here in Buffalo, New York. It’s not magic or sorcery; I’m not a time traveler, or a “Jumper.” I’ve simply got a device in my hands and a lovely little app called Periscope, that can take me all over the globe without even getting up off my perch. After having it on my bucket list for several years, I can finally say now that I’ve completed my Project 365 initiative. One photo each day for a year…. and I’ve done it! It wasn’t easy at times, some days I struggled to figure out what to do my photo of, but now that I’m done, I just wanted to collect some quick thoughts on the project. Some days were easy. Those were the days when I was busy and had things going on, whether it was a hockey game, a concert or a vacation. The photos for those days were no-brainers and made the project super easy. The struggling days were those where I didn’t do anything of significance, or all I did was work and go straight home. I couldn’t very well take the same photo every day, so I really had to get creative. This project pushed me to take more walks around the area and see different things in order to get different photos on these days. It’s really neat now to look back over those 365 photos and see all that happened. As I said, some photos are more interesting than others. Some days, I dreaded trying to force myself to find a photo to take. But other days, it was really fun, and I had a number of photos to pick from for a single day. Either way, it was a neat project and I’m glad I was able to stick to it. My mom asked me if I was going to start it up again, and I said…. not right away. I think I should take a little break and then maybe I will do it again someday. For now, it feels weird to not have to think about a photo every day.